Walden Farms Calorie Free FLAVORED MAYO's made with no calories, fat, carbs, gluten or sugars of any kind are a delicious alternative to high calorie, high fat MAYO's. Walden Farms FLAVORED MAYO's are made with fresh natural flavors including buttermilk and sour cream, mild Chipotle, Dijon Mustard, real honey, Pomegranate, Cranberry, lemon juice, and so much more. Switch & Save up to 600 calories preparing tuna, egg, chicken, potato or macaroni salad! Delicious on sandwiches, wraps or as a dip. Walden Farms Garlic & Herb Sauce has the perfect balance of minced garlic, chopped onion, savory herbs & spices including oregano and parsley. 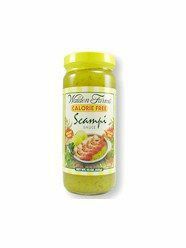 Perfect for Scampi, a marinade or stir-fry sauce for beef, chicken, fish and veggies. Switch and save hundreds of calories every time! Gluten Free, Sugar Free and certifed Kosher. INGREDIENTS: Triple Filtered Purified Water, Polydextrin, Salt, Natural Flavors, Natural Herbs and Spices, Monoglycerides, Sodium Benzoate, Xanthan Gum and Sucralose. 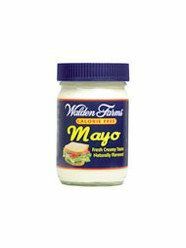 Walden Farms Calorie Free MAYO is a delicious alternative to high calorie, high fat mayonnaise which can easily add 400 to 600 calories to a sandwich or tuna fish salad. Smooth and creamy, Walden Farms MAYO is made with egg whites, lemon juice, white vinegar and other concentrated natural flavors, yet has no calories, fat, carbs, gluten or sugars of any kind. Don’t deny yourself the satisfying taste of mayonnaise, enjoy delicious sandwiches, salads and appetizers. Switch and save hundreds, even thousands of calories. INGREDIENTS: Water, vegetable fiber, apple cider vinegar, white vinegar, corn starch, xanthan gum, lactic acid, beta carotene, egg flavor, mustard, lemon juice, sea salt, food color, sucralose, paprika, sodium benzoate. 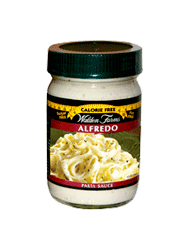 Walden Farms Calorie Free FLAVORED MAYO's made with no calories, fat, carbs, gluten or sugars of any kind are a delicious alternative to high calorie, high fat MAYO's. Walden Farms FLAVORED MAYO's are made with fresh natural flavors including buttermilk and sour cream, mild Chipotle, Dijon Mustard, real honey, Pomegranate, Cranberry, lemon juice, and so much more. Switch & Save up to 600 calories preparing tuna, egg, chicken, potato or macaroni salad! Delicious on sandwiches, wraps or as a dip. INGREDIENTS: Purified Water, Vegetable Fiber, Sea Salt, Apple Cider Vinegar, White Vinegar, Corn Starch, Xanthan Gum, Lactic Acid, Sour Cream Flavoring (Non Dairy), Beta Carotene, Egg Flavor, Dijon Mustard, Lemon Juice, Food Color, Sucralose, Onion Powder, Garlic Powder, White Pepper, Dried Parsley, Cayenne Pepper, Paprika, Sodium Benzoate (to Preserve Freshness). 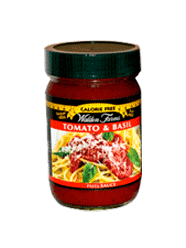 Walden Farms Tomato & Basil Sauce is prepared with the rich natural flavors of sun ripened crushed tomatoes, minced garlic and freshly ground herbs including rosemary, parsley and aromatic fresh basil. Gluten Free, Sugar Free and certifed Kosher.